Drinking tea before bed, when coughing, is not always the best way to ensure someone gets restful sleep. Instead, we may look to tinctures, pastilles or cough drops since these contain less liquid. Itching, scratching, and burning are not fun, especially if they’re accompanied by other symptoms of a cold or a more serious virus. Sore throats can be downright miserable. 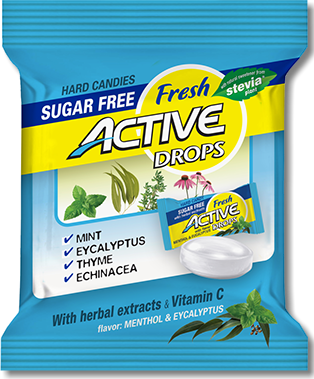 Active Drops Fresh will help you relieve dry cough as well as sore throat. It may also release the nasal passages. 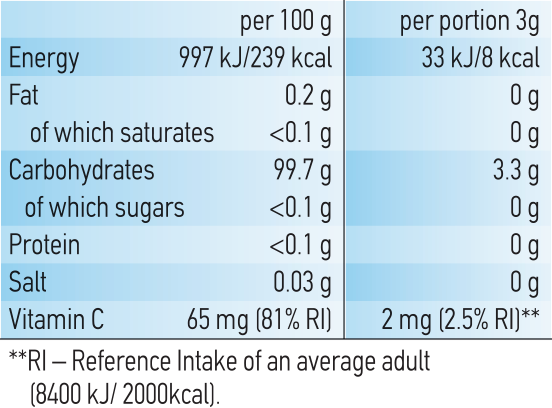 Our body uses antioxidant vitamins, such as C, to boost the immune system, warding off the free radicals. 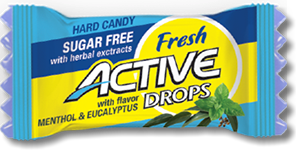 The flavor of Menthol & Eucalyptus is both tasty and alleviating. It is antibacterial, antifungal, antimicrobial, antiviral, anti-inflammatory and decongestant in nature, which makes it a good ingredient in many medicines that treat respiratory problems. common cold by almost one-and-a-half days. Peppermint can be effective at soothing cough and common cold symptoms It can also help build a stronger immune system and has both antimicrobial and antioxidant qualities. It is often used as a natural cough remedy. It contains thymol, one of the important essential oils. Thymol has been found scientifically to have antiseptic, and anti-fungal characteristics.